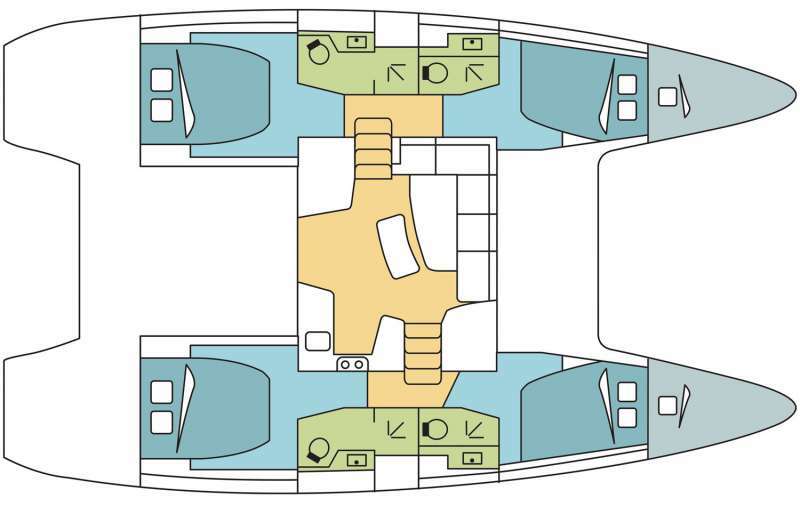 CruiseNautic is ready with their brand new 2019 Lagoon 42 crewed charter yacht. Offering 3 guest staterooms and 968 sq. ft. of sail, this 42’ catamaran has an updated design that maximizes comfort and boasts plenty of lounging space. Lounge in the Caribbean sun or shade on the rooftop, trampoline, cockpit, or on the giant “sugar scoops”, perfect for dangling your feet in the water. You can also use the sugar scoops to launch all your adventures - fishing, diving, boarding, you name it. These are one of the sweetest features on the boat. No pun intended. Luxury meets adventure aboard CruiseNautic. It’s stunning, modern design inside and out doesn’t leave you wanting. It is capable of going where so many other boats can’t so get ready to adventure in style! Slumber in the comfort of your private queen stateroom with en-suite bathroom and magnificent views through oversized windows. This jury on this yacht is out and it has several huge awards including Cruising World Boat of the Year 2017, Asia Boating Award 2016, Sailing Today Awards 2016 Multihull, Sail Best Boats 2016. We know you’re going to love this boat as well. From gourmet onboard dining to the adventure gear tucked below decks, our experienced crew will guide your crewed yacht charter vacation to your exact tastes. There’s so much awesomeness to see in the Virgin Islands, so get ready for an unforgettable sailing vacation. This is the way to cruise. CruiseNautic offers biodegradable soaps, shampoos/conditioners and cleaning products. Contact us for rates and current availability or to book a charter aboard CruiseNautic! There are three luxurious guest staterooms each with queen size beds, ensuite electric heads, and air conditioning. Share your wildest cravings and we'll raise our recipes to the challenge.